An island of art, fun and culture with a twist of Moscow glamour. 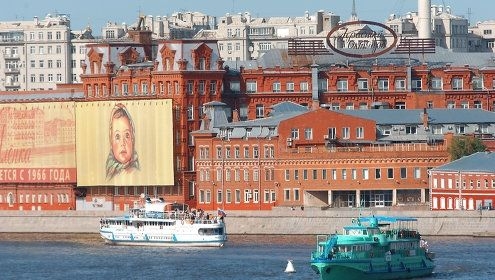 A few years ago, the site where the iconic red-brick Krasny Oktyabr’ (Red October) chocolate factory once operated was transformed into something quite unusual to Moscow – a bohemian island of art, fun and culture, comparable to hipster paradises like London’s Shoreditch area or New York’s East Village but with a twist of Moscow glamour. Well, the factory compound is still standing but what you find inside has little to do with the production of the trademark Alyonka chocolate. Chocolate production moved out in 2007 and an art-cluster of hip bars, trendy restaurants, contemporary galleries, happening clubs, clothing and bric-a-brac shops and other artsy joints moved in. We know that figuring out what is what (and where!) can be somewhat of a challenge at first so below is an overview of what is currently all the rage at Red October. 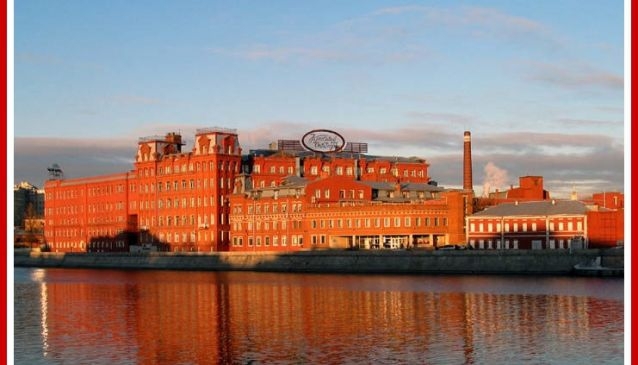 The most prominent arts & education establishment on Red October is the Strelka Institute . The five founders envisioned a “stock exchange for human capital, a place shaping a flow of creative energy” that would transform Russia’s physical and social environment and that is how the cradle of ideas that is Strelka came to be. To achieve its mission of generating knowledge and producing and realizing new ideas Strelka hosts open lectures, conferences and film screenings. Afterwards visitors are encouraged to visit the bar to talk and deliberate over a freshly brewed coffee and a croissant or a glass of fine wine accompanied by a freshly cooked delicacy. If you’re into photography then head on over to the Lumiere Brothers Center for Photography to see the most interesting retrospectives of international and Russian from the modern days all the way back to the early 20th centuries. 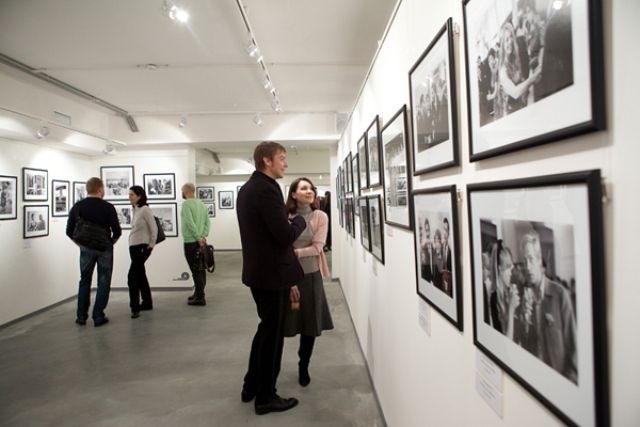 In recent years The Lumiere Brothers Center has greatly widened its repertoire and now also hosts regular master classes from leading Russian photographers, workshops and other educational evenings, stages concerts of some great indie bands from Russia and the West, has indie movie and documentary screenings and boasts a very well-stocked store, where photography connoisseurs can find virtually anything to suit their needs. And if you really don’t need to be anywhere for a while, grab a seat in the snazzy little café & library and glance through some colorful photo albums over a cup of freshly brewed coffee or learn the basics of photography whilst sipping one of the exquisite sorts of teas. The more peckish visitors will be pleased by the selection of freshly baked pastries, salads, sandwiches and soups. The Red October Gallery , a non-commercial institution of contemporary art, opened its door in September 2012 with the solo show of Vladimir Arkhipov "Handmade Russia" and has since been successfully fulfilling its mission to promote modern art and design. Not everything at Red October is solely about the arts. The Digital October Center provides a venue for Russian and foreign IT gurus and new media experts to come together and share their knowledge through meet-ups, workshops and conferences. Many events are free of charge. For those who prefer a slightly more upscale Italian eatery Bontempi will be the perfect place to have a pleasant business lunch or a romantic dinner. Set right by the embankment, the restaurant offers a lovely view of the river and the Cathedral of Christ the Savior. In the summers guests can also enjoy their meals on the spacious outdoor terrace. The quality of the food is ensured by the restaurant’s head chef, Valentino Bontempi, who is dedicated to bringing Moscow the finest of what Italian cuisine has to offer. Il Signore Bontempi has created a very purposeful and particular menu - with no compromises or sushi. What the restaurant lacks in the pizza department it makes up in the richness of the variety of starters, salads, risottos and pastas, fish and seafood and meats. Apart from the normal menu, guests can also choose from specials that change on a daily basis as well as great deals in the form of business lunches on weekdays. What was previously known as Art-Akedemia re-opened its doors in April 2013 under new management (founders of Gipsy, Bar & Shop Denis Simachev, Zu café and the Russian franchise of Pizza Express) and has the (slightly) mysterious name WT4. The concept is strange yet brilliant! WT4 has two very different menus – that of Pizza Express and Zu Café – in one space. The interior consists of a wonderful combination of industrial, futuristic and classy. The ceiling is left raw, with ventilation pipes extending all over and glowing halo lamps hanging down; glowing butterfly installations and a large graffiti depicting a crocodile (the symbol of WT4) on one of the walls provides unusual yet atmospheric decoration, or as the art director Maria Vdovina put it, the style they were going for was “intellectual punk”. A prolonged bar area is convenient for those who want to get a drink quickly, while the comfortable couches and sofas are meant for guests who are in no significant rush and want to enjoy their food. Unlike some other places at Red October, the quality of the food is high, while the prices are amazingly low! Evidence to that is the lack of free tables, especially during lunchtime. Guests can choose from pizzas, pastas and salads on the Pizza Express menu and Thai, Chinese, Vietnamese and Malaysian specialties from the Zu Café menu. Australian chef Jay Miller has also concocted a special menu consisting of 15 dishes. Drinks are not too expensive and on weekends the restaurant also hosts all sorts of parties and special music events. Another must for foodies at Red October is restaurant and lounge Reka. 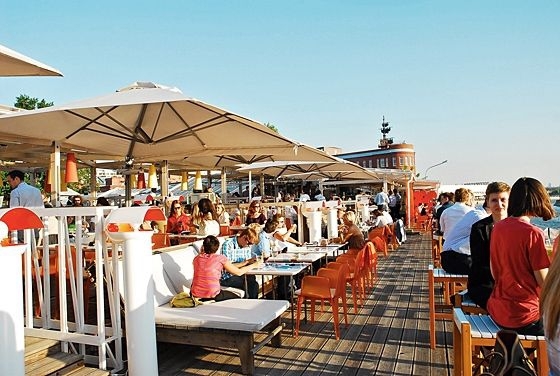 This stylish and trendy place has an unparalleled view over the Moscow River and features the best of European and Japanese cuisines created by award-winning chef Michel Lombardi who’s got more than a few years of experience at top restaurants in London, Milan and Toronto. The interior, designed by Vincezno Casini (who was in charge of the décor for Prada stores worldwide), is elegant to the finest detail while remaining cozy and unpretentious. The menu boasts imagination and integrity and the finest traditions of home cooking with a modern twist. Ingredients are fresh and always prepared to order. Don’t miss out on house specialties like pan seared pistachio crusted red mullet and quall stuffed with mushrooms in truffle sauce. The house sommelier will delight the most discerning guests with a very comprehensive selection to complement any dish on the menu. Reka is perfect for a relaxing evening at the bar and lounge (and in the summers on the terrace), a sumptuous meal or a karaoke night. Produkti café & bar is a more low key and unpretentious place to grab a bite and a drink. Two years ago four friends decided to open up a place at Red October with the philosophy of not trying too hard to impress anyone: the interior is minimalistic, the furniture vintage, and the food Italian. That is not to say that quality takes a back seat. Far from it. The head chef is Giuseppe D’Angelo, straight from Naples with love. Alexander Ananiev, with some impressive bars such as Lebedinoe Ozero, Rolling Stone Bar and Bar Luch on his CV, is in charge of the drinks menu. And yet the prices remained very reasonable by Red October standards! If you come on a weekday afternoon you’ll be spoiled with a tasty business lunch and all for only 280r. At nights Produkti doesn’t die down. Quite the opposite, actually. Fridays and Saturdays anything can happen, starting with a lively jazz quartet playing their hearts away and finishing with DJs pumping banging techno. One of the hottest clubbing spots in Moscow is, undoubtedly, Gipsy. But word of warning: it’s not that easy to get in without knowing someone who knows someone! This, however, guarantees that the crowd is always interesting and intelligent - but by no means boring! This trendy club is not for lightweight partygoers: top European and American DJs spin the best and freshest tunes from the underground techno and deep-house scene until the morning comes, so expect a memorable night of dancing and raucous fun! Everything about Gipsy is eclectic, starting from cartoon graffiti on the walls and the Saturday Night Fever-esque dance floor and ending with 400 disco balls hanging from the ceiling. 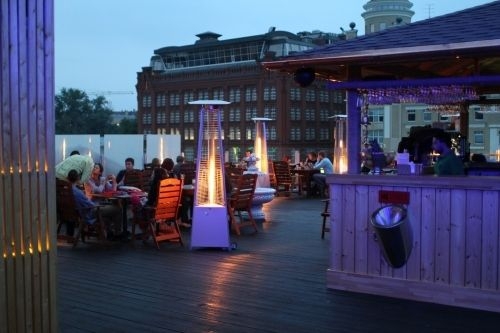 Perhaps the coolest thing about Gipsy is the summer veranda, which overlooks the Moscow River and makes for a very spacious and atmospheric party environment. Although Friday and Saturday nights are the busiest and most happening, other nights of the week Gipsy is open from noon until 6am and the programs vary from jazz to funk and rock. A new, exciting and promising place is Joys Bar ). At first glance you cannot but notice an air of a classy American steakhouse, you almost expect to see Al Capone sitting somewhere at one of the corner tables slowly puffing on a huge cigar. But a closer look reveals the pleasing self-irony of this bar: the surface of the walls varies between bricks and fuchsia wallpaper and the commanding wooden bar stand unexpectedly starts lighting up with all the colors of the rainbow. No one will ever go thirsty here. All the classics are on the cocktail menu, plus specially created liquid innovations. And even if you don't find anything that would quite tickle your fancy, the exceptionally professional barmen will mix anything you like. Food to go along with any drink can also be found and is mostly of the European-American gastronomical persuasion. Fridays nights get jiggy to the best of chart music and on Saturdays your ears will find delight in the sonic heaven of commercial house music. The jumpiest and most down to earth club/bar at Red October is Bureau Nahodok (Lost & Found). Head here if you’re not in the mood to deal with strict face control or dish out a fortune for drinks if payday is still far away. Partyheads can take advantage of all sorts of deals here: 300r shishas and two-for-one vodka and whiskey colas on Sundays, BYOB banquets, birthday discounts equal to your age (but only up to 33) and, very soon, 1500r for all you can drink! With deals like that it’s very hard to go wrong and not have the funnest night ever. There are two rooms with different music styles. The main room plays all sorts of electronic whilst speakers in the other room blast old and new rock and pop favorites such as The Offspring, Nirvana, Britney Spears, Madonna and some Russian bands. Once we even heard “Scotty doesn’t know”! Spread over two floors, Wunderbar has earned a top-notch reputation - despite its very recent opening - as a cozy and intimate bar where no one’s a stranger and all guests are friends. The first floor, with its light-up bar and a stage for live performances and DJ gigs, makes for off the hook parties on weekends and the second floor offers an oasis of calm for those who just want to chat. Not only Fridays and Saturdays are eventful, though. During the week it operates as a DJ bar and when there’s a game on be sure to come down and root for your team. Drinks are exceptionally yum and the food is definitely of the mouth-watering type! Red October is definitely the place to be! We hope that this guide helps you figure what to see and where to eat and drink!